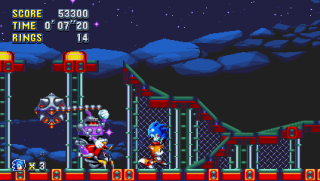 The Heavy Rider is one of the Hard-Boiled Heavies and the tenth major boss fought in Sonic Mania, along with her trusty Moto Bug steed, Jimmy. In Mania Mode, she is fought when playing as Sonic, Tails, Mighty or Ray, while Knuckles fights a different boss in his own path. In Encore Mode, the player can choose to fight either boss. The fight takes place on-board a giant rocket set on a course to the Little Planet. From v1.0 to v1.03, the rocket never moves; as of v1.04, the rocket will lift off just before the fight begins and will slowly rise up as the fight progresses. She may choose to drive up onto the ramps and make a daredevil jump over two flamethrowers that will spit fire all over the arena. This will get the crowd cheering and cause confetti to rain down on the arena. During this attack, the player must stay out of the center of the arena unless they have a Fire Shield. She may also choose to ride off the left or right sides of the arena, rev up some speed, and zoom across to the other side with the mace held out in front of Jimmy. If she decides to do this right after the above stunt, she will leave a flaming trail that will hurt the player. After eight hits, she will be knocked off her steed, ending the boss fight and allowing the Capsule to fly in. Jimmy the Moto Bug is a tribute to Sonic Retro community member Polygon Jim, who passed away in a car accident in 2013. He was famous for creating Motobug the Badnik in Sonic 1. This page was last edited on 17 July 2018, at 12:29.